As a mainstream animated feature, Bolt ably stands up with the best of them, only with a smaller presence. In recent years, Hollywood has set the bar so high for animated storytelling (Ratatouille), it's impossible for every entry to live up to it. Imagine how amazing the movies would be if they all did! In the movie, Bolt (voiced by John Travolta) is a white German Shepherd who stars in his own science fiction TV series - only he doesn't know it. The show's director (James Lipton) tells a network executive that in order for Bolt to give his best and most genuine performance, the television crew must convince the dog what he's seeing and doing is real. If the dog thinks it's real, the show will be more realistic. Such a premise is reminiscent of The Truman Show, which starred Jim Carrey as a man who lived on TV without ever knowing it. Like that film, this one is meant to question the humanity and sanity of taking artificiality too far and the price of realistic entertainment. Those same ideas and themes are kept intact despite Bolt being a family picture, so it's likely kids will take more away from the movie than they initially thought. On the show, Bolt is genetically altered into a crime-fighting super dog, with the ability to bust through walls, shoot green lasers out of his eyes, jump great distances and invoke a super bark that causes the earth to tremble. His owner, both on the show and in real life, is the loving Penny (Miley Cyrus), who wants to take Bolt home with her after production wraps, but her agent (Greg Germann) tells her it would break the show's illusion. To generate higher ratings, the show's writers come up with an episode cliffhanger. Penny is kidnapped by her arch nemesis, Dr. Calico (Malcolm McDowell), and viewers must wait until next week to see what happens. Bolt, of course, is used to saving Penny at the end of the day, every day, so when she's kidnapped, he naturally thinks it's real and won't rest until he rescues her. Bolt escapes the set but falls into a shipping box full of pink packing peanuts, which he thinks weaken his super powers. Bolt winds up in New York City, unable to utilize his strengths. To find Penny, he demands help from a street-wise alley cat named Mittens (Susie Essman), who looks a lot like Calico's fiendish feline. The two of them, along with a hamster named Rhino (Mark Walton), who's a TV enthusiast and big fan of Bolt's show, trek across the country from New York back to L.A. On the way, Mittens tries to set Bolt straight about his powers and advise him of what's real. 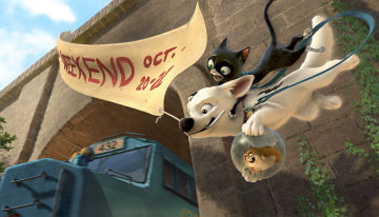 In many ways, Bolt is a bittersweet coming-of-age story for the titular pooch. Just as Bolt must face a harsh reality check, he also learns new things like how to beg humans for food, how to play with other dogs, and just how good a feeling it is to stick your head out of a moving vehicle, tongue and all. We get a kick out of watching Bolt learn and grow and even though he's a dog, we find him identifiable and endearing, hoping and wishing he'll be reunited with his "person." A couple things I would have changed about the movie were the voices of John Travolta and Miley Cyrus. They're adequate voice actors, but they're perhaps too nondescript. The studio seems to have picked them because of their famous names and not because of their talent. I'm not sure I would have picked A-list celebrities, but people whose voices seemed more fitting. Travolta's voice, in particular, seems too high for the main character. Bolt may not have the level of sophistication as other animated features, most notably the Pixar films, but it's light, bright and entertaining. It contains a lot of laughs and some fun, silly moments, highlighted by the overzealous Rhino, who steals every scene he's in, and a group of twitchy New York pigeons. I enjoyed the high spirit and sense of humor of Bolt, and while the complete premise may fly over some kids' heads, they'll still enjoy the zany characters and pumped-up action. Adults will like all that plus the satirical jabs at the entertainment industry, even if those jabs have already been taken in other films. I don't think Bolt was meant to raise eyebrows by how much it would change animation or the family genre, but it will please those who wish to see something cute, fluffy and feel-good. During this time of year, what more could you ask for?